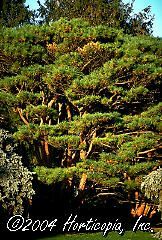 Multi-trunked shrub-like pine. The branches form a flat topped umbrella like head. Densely arranged bright green needles. Grafted on a standard to make a striking special form plant.